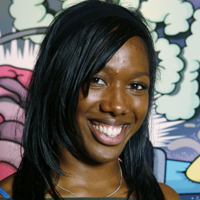 Sportsister talks to Team GB sprinter Montell Douglas about her first Olympic Games, her sporting heroes and what it means to her to have the Games coming to her home city. Tell me about competing in your first Olympic Games? It was absolutely amazing; it’s hard to explain to people what it was like out there. One of the highlights was seeing some of the different sports because one of the things with track and field is that you only ever see those events. It was great to see some of the swimming, BMX and loads of other different sports too, and to meet the athletes from those sports. It was definitely a different experience for me. Did you get time to actually go to the other events? We didn’t really get to go to loads of the live stuff as the time table was really tight, but we did cheer everyone on from the village. There was always a group of us in our living room sat cheering everyone on. When we finally met everyone on the last night, like the sailors who were based outside of Beijing, it was amazing. It was so spectacular I nearly cried, it was really emotional but I had the best time. What was the atmosphere like among Team GB in Beijing? I’ve been on a couple of big teams, but it was a complete change from the Worlds last year. There was an amazing spirit between everyone. You’d see different people from different sports from around the village and we were in the same kit so we had that unity together. You’d also see a lot of international athletes that you haven’t seen for a while too and it was great catching up and seeing how everyone is doing. It sounds like a very special experience. Unique is the word to describe the Olympic Games, it is the highest sporting achievement you could ever imagine. Everyone is watching and everyone is supporting you and from the moment we left Hong Kong airport to go to Beijing we were treated amazingly. As soon as we saw the torch and the nest, everyone just went mad on the bus. We all just kept screaming “we’re at the Olympic Games!” It was a bit of a shock and hard to take in. Seeing Christine Ohorougu win gold, what kind of a boost to the athletics team does that bring? We were all watching and cheering her on. We knew what kind of shape we were all in so we were hoping for the best for everyone. 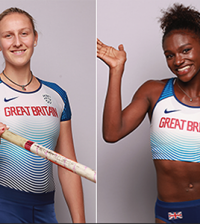 To see all our GB medals, especially on the track with Jermaine in the high jump and Tash in the hurdles as with Christine, it was just a shock – we all know these people and now they’re Olympians! It was really brilliant and brilliant for them as well, it’s a massive achievement. It’s from years of hard work; we know what you put in to get that out. You got through to the second round in the 100m, were you happy with your performance? Yes and no, if I was going to be strict on myself and look back at it then on paper I’d say no, because I really wanted to make at least the semi final or final and I didn’t make any of those so in that sense it’s a failure. I believe that failure only spurs you on because you fail to succeed. When you fail you want to push on. For me, I made it to my first Olympics. I didn’t think I was going to make it there and I put in my best performance on the day. I was pleased to have been there and experienced that and now I know where I need to be. I know where I’m not at the moment. I think that’s sometimes more important. It helps you bounce back and bring it back to the table after a competition like that. Can anyone challenge the Jamaicans in sprinting right now? Yeah definitely, everyone is beatable; I’ve learnt that over the past two years, even more so this year. In sport you want respect, you work as hard as everyone else in the world, you train as hard and you’re just as dedicated, so really why shouldn’t you beat them? Everyone’s beatable and everyone’s human. 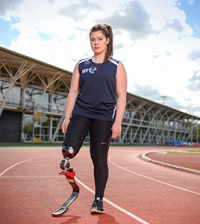 What does it mean to you as an athlete for London to be hosting the Games in 2012? For me in 2012, I need to throw everything in there. I want a medal, I don’t care what colour it is. I’d love to be Olympic champion one day but it’s going to be tough with the American’s and the Jamaican’s. But from our performances this year you really realise they are beatable and we can be out there with them. The home country always performs, as they step up their game. I think there will be a lot of shocks and surprises. We have a lot of people coming through, there’s so much potential now. Think how many medals we got this year at Beijing across the board in different sports and I am sure that will only improve in 2012. I think that’s why we’re getting excited, everyone is thinking “wow” British sport is holding it’s own. What do you think can be done to help stop teenage girls dropping out of sport? I would always say have fun with it and get involved. A lot of people don’t have fun with it anymore and they start feeling unfeminine, but sport doesn’t have to be like that. I never found it like that, it’s a gift to me, a gift from God and I use sport to express myself. I’m a beautiful young athlete and showing the world what I can do. If sport is what you do, just do it. If that’s what you’re born to do, if that’s what you feel inside you want to do then do it and have fun with it. I wouldn’t be doing it if I didn’t have fun and didn’t enjoy it. Do you have a hero in the sports world? In many ways it is Christine Ohoruogu. I see her on a daily basis and I’ve seen her struggles and what she’s been through with her knee troubles. People really don’t realise she’s still young, a young woman athlete trying to fight through those barriers and that’s a really tough thing. It takes a lot of hard work to become an Olympic champion and for me they’re the heroes. She didn’t make it to Sydney and she’s been injured forever but it’s made her the person she is now. Everyone asks her for advice and she always tells me what I want and need to hear. She’s very true to herself and she’ll do whatever she needs to survive. And that’s what made me always fight. You have to work 100 times more than anyone else to get to where they are. Don’t whine and complain about it – just get on with it. Go and train and you get your rewards.